A suburban mother who became a voice of the gun-rights movement when she openly carried a loaded pistol to her daughter's soccer game was fatally shot Wednesday along with her parole-officer husband in an apparent murder-suicide at their home in Pennsylvania Dutch country, authorities said. Police released scant details about the deaths of Meleanie Hain, 31, and Scott Hain, 33, but said more information would be released Friday after their autopsies. 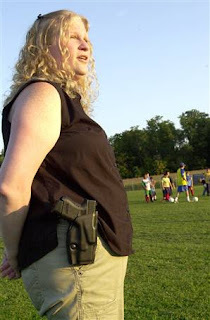 Melanie Hain, who was cited for open-carrying a handgun at a soccer match in 2008 [see Geek Article here] was shot and killed, along with her husband yesterday, October 8, 2009. Neighbors said the children ran outside and said their father had shot their mother, but Wright declined to disclose what investigators have concluded about how the deaths occurred. Out of respect for the family, I will make no comment, other than to say that my position on the legal carry of firearms is not modified by this tragedy. Somali pirates in two skiffs fired on a French navy vessel early Wednesday after apparently mistaking it for a commercial boat, the French military said. The French ship gave chase and captured five suspected pirates. Is this an argument for unarmed vessels in the high seas? A teacher convicted of child abuse after her students drank a soda laced with hot sauce will not be going to prison.Sylvia Tagle was found guilty of one count of child abuse after, prosecutors said, she intentionally allowed children at Bob Graham Educational Center to drink the spicy soda in order to teach them a lesson about not taking her drink. Uh, is this a tempest in a teapot? The story doesn't provide the grade-level of the students (which might not correspond to the level of maturity of the students), but apparently the teacher added "hot sauce" to her soda, which presumably resided on her desk during the school day. Another presumption was that her students were in the habit of drinking her soda during moments of the teacher's inattention , or more likely absence. The charges imply that she deliberately added "hot sauce" to her drink in order to "booby trap" her soda. The reason? To keep her students from drinking her soda. The question sees to pivot on whether she deliberately hotted-up her Pepsi to dissuade her students from drinking out of her cup, or whether she 'typically' hotted-up her Pepsi because she likes it that way. Drinking even unadulterated Pepsi (no evidence that this was her soda of choice) seems, in itself, sufficiently teeth-gritting. Anyone who regularly adulterates her soda with hot sauce for her own enjoyment is suspect in my eyes. Ey-eeeeeew! Which undermines credence of her defense I'm thinking. Oh the other hand, if the little ragamuffins were slurping from her slurpy uninvited, I'm thinking You Go, Girl! The Minor Monsters ought to keep their noses in their school-books, not in Teacher's 7-11 Monster Cup. How better to bring the lesson home, other than to make it a zero-sum Moment? "Pet my dog? Sure. Read my Cliff-notes? Maybe. Drink our of my Pepsi Mug? Only at your own risk." If she did, indeed, deliberately booby-trap her 16 oz Pepsi by making it taste BAD, I'm thinking that she ay have taught her students a far more useful lesson than the Three R's. This is NOT "A Bad Thing" that she did. If it were up to e, I would give her a 12% bonus this year. Ten percent for living up to the expectations of being a Teacher, and two percent for originality. And these yahoos want to put her on probation? Pfahh! A pox on all their houses! I'm sure glad that I, or my children, or my children's children, don't live in Miami. Those folks are all folked up. Bunch a little beggars -- Not only the students, but also the School Administration, and the School Board. Actually, the blogsite started a while before the statscounter dot com statistics software was installed, but that's not important. The BIG blogs often receive that many hits on a single day. Still, I choose to interpret this milestone as meaning that I am providing information which is of interest to more than a handful of friends and shooting buddies. I think I could round up more "returning visitors" if I stuck to IPSC/USPSA topics, or even to "Shooting Sports" topics. However, my interests are wider than that. If you don't like to read humor, cultural or political articles, you still have the option of "voting with your feet". I hope you stick around, though. While I write primarily for myself ("because I must! "), my original intention was to provide useful information to IPSC/USPSA competitors. It's just that I think IPSC folks are interested in more than a single topic. And so, of course, am I. It has been a few months since I was able to conduct a class in Introduction to USPSA at the Albany Rifle and Pistol Club. I've had family birthdays and other family situations which fell in unfortunate conflict with the regular first-Saturday schedule, and Mac has had to take up the slack. I hadn't realized how much I missed this opportunity to familiarize "New Shooters" in the arcania of Practical Pistol shooting in the past six months, but to my joy I discovered that I had as much fun yesterday (October 3, 2009) as I did during my first instructional experience in June of last year. Mac only identified one student (Corbin) when he notified me that a class was scheduled for October, but one is enough. I was surprised -- and delighted --- when Luc ("Luke") and Gerry showed up for the class. One is enough for a good class, but having other attendees allows them to get to know other people in approximately the same situation. That is to say, they're new to competition in this oddball sport, and discovering that they're not the only people who are interested in IPSC/USPSA competition allows them to share their questions and experiences. stage walk-through, and the value of understanding the nuances of a stage before shooting the stage. Two of the students had studied the Columbia Cascade Training Manual (see link to the document at the CCS website, here) and had completed the worksheet. One student had not read the manual or completed the test. That he did not have the information needed to answer the 20 questions on the test, but still performed adequately during the live-fire portion of the class, proved that reviewing the test in class helped train people who don't have the advantage of having read the preparatory materials. In fact, after an hour discussion of the test questions the live-fire exercises showed no difference of actual gun-handling or stage-engagement ability between the two students who had read the material and completed the test, and the single student who had not been exposed to USPSA training documentation at all. I hope that the student who has not read the manual will take the opportunity to do so before the test-match next weekend. We cannot teach all of the basic concepts in class, due to time constraints. We expect the students to read the manual before the first exposure to competition, both for their benefit and because we want to make sure than miscellaneous Safety concepts have been provided even if they are inadvertently overlooked during the three-hour live-fire instruction portion of the training. It was no surprise to me that I found each of the attendees to be responsible, safety-conscious and skilled gun-handlers. We saw no major safety violations no safety violations at all -- these guys knew how to handle a pistol safety, and it took no more than a few prompts to keep the muzzle pointed downrange and the finger off the trigger. I brought my camera with the full intent to film the attendees, for their own benefit during the class. In the actual event, I had no time to use the camera. It wasn't really necessary, but I would welcome the opportunity to film a class some time in the future. I think it is (or would be) a valuable training tool, but perhaps more usable if the resultant videos could be used during the class rather than posted on the Internet for everyone to see. It's not a way to embarrass students, but a tool which they can use to improve their performance. But that is for a future date, with perhaps a smaller class and a dedicated photographer. Perhaps I can convince SWMBO to come along to perform that function. One of the attendees (Gerry) noted in conversation that he would like to get his wife interested in USPSA competition. Actually, she is already interested, but she is hesitant to enter training and (after that) competition because she doesn't feel comfortable in the milieu, although they have watched IPSC/USPSA competition at the ARPC club. SWMBO has been available for the past several years to introduce women to USPSA, and to help make it clear that "Girls Can Do This". Although SWMBO will not, in the near future, be able to provide an active role-model in USPSA competition (because she has Lung Cancer, and cannot 'move about' without an oxygen tank on her back), she may be able to fulfill the duties of a "Demonstrator" for this very limited set of scenarios. More important, she can server as a Role-Model to show prospective women competitors that competing in USPSA is a viable proposition for women as well as for men. I know that SWMBO loves USPSA competition, and misses it more than you may imagine. Perhaps it would be valid to set up a class with only prospective female USPSA attendees, with a contribution by SWMBO to be limited to one or two demonstrations, and perhaps an opportunity for female attendees. to discuss the USPSA experience. This last concept is very much off-the-top-of-my-head, but I am confident that we can define a situation in which she will be not only capable, but willing to participate. It depends on her physical limitations, and the demand for a lady instructor. It may not be possible to set up until late next spring but I know that new lady participants are more likely to be convinced by another lady shooter than by anything I can say. What about it? Are there men out there who would welcome an "Introduction to USPSA" class which was oriented toward Lady Shooters if there was an established Lady Shooter available to take an active role in the training? Back in mid-august of 2007, I wrote an article about "ASBO", which is shorthand for the "Anti-Social Behavior Order" which The Brits hand out like parking citations rather than to arrest hooligans for -- well -- hooliganism. The Brits call hooligans "YOBs". It's "Boy" spelled backward, and generally refers to "a thuggish young male". It's suppose to be a form of a social contract. The police identify a "Young Boy Behaving Badly", speak to him firmly so he supposedly (a) knows what part of his behavior is unacceptable, and why it is unacceptable; (b) draw up a document in which the YOB promises to never never act badly in that specific way again; and (c) if the YOB once again is found to behave badly in exactly the same way, he is subject to criminal penalties. My thesis is that if the YOB misbehaves in a manner which is not legal, he should be subject to punishment for a criminal action the first time. This may not change his mind, but at least it gets him off the streets for a while. It serves the further purpose of suggesting to his victims that if they are the object of his mis-behavior, the police will respond with alacrity. The problem with ASBOs is that the victims feel -- and with good reason -- that their demand for equal protection under the law is NOT taken seriously. However, the way it works is that the YOBs get an ASBO each and every time they act out, and they routinely ignore them. And the police ignore the repeated cycle of lawlessness. In point of fact, my original article served to initiate a dialogue with a British citizen who claimed that he was a police officer and was proud to be one of the most prolific writers of ASBOs. My thought was that, if his area of responsibility was so inundated by YOBs, the public might be better served if the police took a few of the off the streets, instead of merely giving them a stern talking-to and accepting their solemn promise to go and sin no more. The YOBs are demonstrably without honor, or any concept of honor, by definition. The resulting exchange of email between myself and "The ABSO-Monger" continued for a couple of days. The most telling contribution was from the research I did, which found a statement from the Britsh Home Office that "ABSOs Work". No one is a bigger fan of ASBOs than street cops. They know that they work. I have put quite a few wrong ‘uns in jail through ASBOs who were otherwise untouchable by the criminal justice system. Believe me – if you had something similar in the States you’d like them too. (In fact I’m surprised you don’t have something similar. No one is a bigger fan of ASBOs than street cops. Certainly the honest British citizen is no fan of ASBOs. Thanks to Kevin at The Smallest Minority. In his October 2, 2009, article ("Get Out. Get Out NOW"), Kevin links to the tragic case of Fiona Pilkington. Fiona Pilkington had two "seriously disabled" children. The local YOBs chose these children, their mother and their home, to be the object of their continued abuse and assault. Pikington complained to the police ... 33 times ... that she and her family were being assaulted by rock-throwing children sometimes as young as 10 years old. Their home was literally surrounded by gangs; her children pummeled by thrown rocks as they biked home from school. The police responded sporadically, never arresting anyone, never charging anyone. One time when a policeman was spotted leaving the Pilkington home, her house was surrounded by rock-throwing children; one parent even challenged her on her doorstep. During the last of the seven years during which this harassment went on, Pilkington made 13 calls to police asking for help. They never responded. Finally, in 2007, Pilkington loaded her severely disabled 18-year-old daughter in her car, drove to an isolated spot, poured petrol (gasoline) in her car and torched it while mother and daughter were inside the car. Their bodies were identified by DNA. The continued assaults on the Pilkington family lasted seven years; it must have become a tradition, almost a 'cultural climate' in the neighborhood to abuse the family. The neighbors knew about it, and they didn't do a thing to stop it. The police knew about it, and they didn't do a thing to stop it. Her MP, David Tredinnick, knew about it, and didn't do a thing to stop it. “common sense and basic old-fashioned policing” had not identified the family as extremely vulnerable. She said that their human rights were being breached because they were victims of a campaign at their home in the village of Barwell, Leicestershire. During four hours of intense questioning from the coroner, Chris Tew, then the acting Chief Constable of Leicestershire, admitted that his force had failed to recognise that the family’s 33 pleas for help were all linked. The force classified the offences as antisocial behaviour rather than as a crime. [emphasis added] He said that things had changed in the force and by the end of this year 2,000 officers would have been trained to spot vulnerable people who were either physically or mentally disabled. "The force classified the offences as antisocial behaviour rather than as a crime." No one is a bigger fan of ASBOs than street cops. They know that they work. No, ABSOs do not work. The street cops like ABSOs because they remove responsibility from the street cops to make the hard decisions to actually arrest someone. When people surrounded the home and broke windows, why wasn't someone arrested? When children pelted the Pilkington son with rocks as he rode his bicycle home, why wasn't someone arrested? Why were a vulnerable mother and her vulnerable children driven to the most painful suicide of all? Could it be because they despaired of ever receiving protection from the mob which the police are presumed to offer to their most vulnerable people? Certainly, British law allows no options for them to protect themselves. Still, would they not be better off in prison because they defended themselves against a mob rather than allowing themselves to be driven to a horrible suicide? Can't a civilized nation even protect its citizens from such an extreme 'solution'? Britain is no longer a civilized nation. British citizens no longer exist; the remnant are British Subjects, who cannot even depend on honest Imperialism to enforce a minimal semblance of civilization ... of humanity. Two years ago I used the British National Health System as a mechanism to define a descent from civilization to Socialism ... which has failed in every attempt recorded by history. I was dismissive of British Socialism, naively assuming that such drastic measures would never become a measure to which Americans would never resort. Today, I sadly admit that Americans seem as liable to accept draconian Governmental measures to resolve undefined "problems" as were the Brits. Considering our current one-sided debates, I despair of the ability of Americans to resist the temptation to allow our country to descent into "Nanny-Statism", resulting in the undermining of support for the common citizen. Anti-Social Behavior Orders - coming soon to an American State near you! UPDATE: 08-OCT-2009: "The whole thing is madness." Kevin at "The Smallest Minority" has an article which is the perfect followup on this. Read it here.